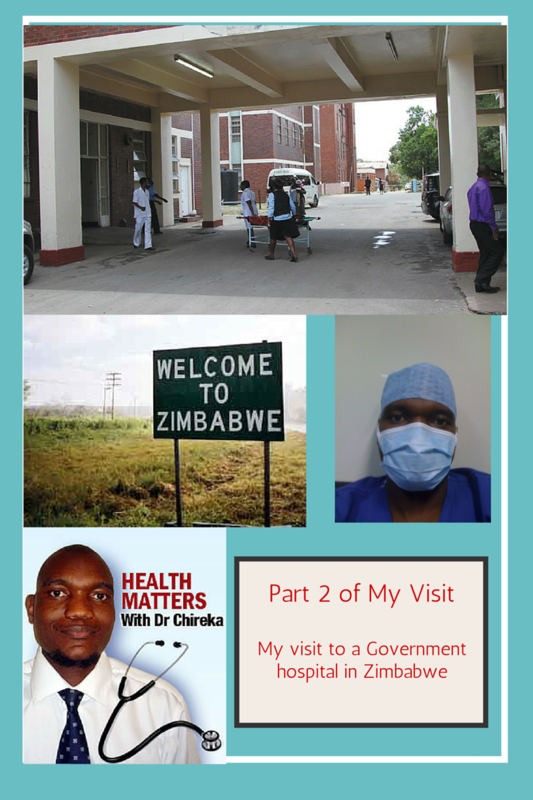 Welcome to part two of my visit to a government hospital in Zimbabwe. I urge you to first read the first part of my visit to a government hospital in Zimbabwe so that you get the full picture of the discussions taking place here. 1- The staff at the information desk treated us nicely and gave us directions to the radiotherapy department. 3- When we could not find the exit from the casualty department on our way to the radiotherapy department we asked the busy staff in the department and they showed us the way out . 4- On arrival at the radiotherapy department we were promptly attended to by the reception staff and put into the queue waiting to see the doctors. 5- As we were waiting we noticed that the queue was moving and we could hear patients being called out to see the doctors. 6- The doctor that we saw was accommodative as he allowed me to be present and was open to discussions. The doctor answered most of our questions and explained how the process worked and apologised for the shortcomings of the system. 7- As we left I saw that the queue was almost gone and soon realised that there were 4 doctors that were running the radiotherapy clinic on that day. 8- When we arrived at the out patient department, there was only one member of staffing manning it. As soon as she saw the queue getting longer she called for help and another member of staff came to join her. We were attended to within 10 minutes. 9- We got an appointment in the next clinic which unfortunately was not until the following Wednesday due to Easter holiday. I was pleased that we got an appointment that soon. 10- When I was planning to visit the government hospitals I was told to prepare for a long wait so I was relieved and impressed when the whole process was over before 1pm. What I did not like about the government hospital in Zimbabwe. 1- The saying that ” there is no hurry in Africa” seems to be true . I did not see a sense of urgency in attending to patients and no patient was given an appointment time. We were just told to join the queue and we will be seen as soon as the doctor was free. 2- No one told us roughly how long we were going to wait to be seen or how late the doctors were running. 3- No one kept any eye on very ill patients who were in the queue. One would expect the nurse to keep a close eye and call for medical help if needed. 4- Different departments do not communicate well with each other so the patients have to repeat their stories several times to different doctors. 5- The patient is now being given tests to keep instead of the hospital to be responsible for that. 6- The attitude of the nurse running the clinic was not good as she shouted at me for being late to get into the doctors room. 7- Transporting of car accidents victims in private cars is not safe . 8- Lifting of injured persons being done by untrained people. 9- Porters in the Emergency department not helping relatives or friends to ferry injured patients. 10- Hospital pharmacy not stocked with most drugs resulting in patients being asked to go to far away pharmacies which at times are expensive . 12-Patients being asked to leave a copy of their tests but no photocopying machine service in the hospital . Let’s look at Part 3 which discuss suggestions on way forward after my visit to a government hospital in Zimbabwe. The voice of the patient is silent and things are done to patients and not with the patient . The patient is like a bag of cotton that must be put on a conveyer belt and pushed from one end to the other. Things are done to the patient and their views are not invited and also patients do not want or fear to voice their concerns. There is a lot of talk going on in buses and on social media about how bad things are in government hospitals in Zimbabwe but no effort is made to capture that and use the formal channels to address these issues. I would suggest that the health system embrace the vision that sees things through the eyes of patients and think with a mindset of a patient and to treat these patients as if it was themselves. Patients are experts in how they feel when not well so must be involved in any medical decision that involves their medical care. It’s high time each and every hospital should have patient participation groups that work with the hospital officials . There are certain things that have got no direct link with the government and can be sorted out by the hospital leadership . Things such as cleanliness of the hospital , quality of food , attitude of the medical staff, arrangement of clinics , running of clinics , professionalism of the staff etc can be dealt with locally by the hospital leadership working on collaboration with patients. In the UK we have what we call POST CODE lottery in the National Health Service (NHS) Post code means simple an address so post code lottery would mean that people get different services under the NHS depending on where one lives. You may have your knee operation paid for in one area and another area declines it . Why should this be the case when it’s one NHS ? I want to use this example so that you realise that we need both committed and responsible political leadership as well as well informed, well engaged and intelligent patients to work together . The postcode lottery in the UK came about largely from the practice of GP fundholding during the 1990s, a system which enabled GPs to receive a fixed budget from which to pay for primary care, drugs, and non-urgent hospital treatment for patients. The concept of a postcode lottery is also a by-product of patients and consumers becoming more aware: patient groups have become more adept at lobbying for their consumer “rights” to drugs and services. The lobbying by patients resulted in better services in those areas that have strong and vocal patient participation groups. The same can happen in Zimbabwe. I hear of sad stories of patients lying on trollies for hours, missed or delayed diagnosis. A delayed or missed diagnosis must be addressed locally by the medical team. Patient groups must be involved and a route cause analysis must be carried out. Mistakes must be identified and systems must be put in place to make sure that it does not happen again. The process must not be for witch hunting but must be used as a learning exercise however if there is gross negligence then the registration board must investigate and take appropriate action. The medical profession has nothing to hide and will welcome working with patients as equal partners. This will help with the identification of issues that need political engagement with the government and those that are academic or administrative that can be addressed locally. This will also give clout to the arguments by the health professionals as they will be speaking with one voice with the patients. Some of the patients are councillors , members of parliament or ministers who can help in influencing things and some may have connections who will make donations to the hospitals or can use their personal money to help buy equipment for the hospitals. Patient participation groups can help to fund the hospital in simple ways . You can boost the moral of ward staff by buying them a microwave to warm their food , a refrigerator , a bread toaster or an electric kettle to just mention a few things. These simple things will go a long way to boast the moral of staff and will go an extra mile in providing medical care to patients as the staff will feel valued. The problem at the moment is that patients blame medical staff and medical staff blame the government but no one looks at the route cause of problems and try to come up with solutions . Failure to analyse a problem will result in coming up with a good solution but for the wrong problem . One can suggest that medical staff must be paid a decent salary but that will not address the problem of poorly organised clinics, medical negligence etc. My point is let us analyse the problem and find solution for it. I have a lot to say on that but will end here for now as I think you got the gist of my point. Let me also touch on the issue of medical aid in Zimbabwe . Some are not happy that medical aid companies are monopolising the health system as there are now the funders and providers of health care in Zimbabwe. This brings in a lot of issues about conflict of interest and also issues about lack of competition in the medical system. The medical aid companies argue that they need to be viable and be able to continue to provide qualities services at low premiums. If that works and is the main reason then I would welcome it. Private doctors are forced to agree to tariffs set by the big medical aid companies and this is unfair for the individual doctors. The doctors associations need to work with these medical aid companies and involve patient participation groups to reach an acceptable agreement that will benefit all the stakeholders. On another note patients need to be educated about their medical aid benefits. Most medical aid schemes put a cap on how much can be used by the patient per year on certain services such as drugs and tests. I have noticed that patients may quickly exhaust their budget in one area and often assume that their medical aid is completely exhausted. Little do they know that the budget on other services such as CT scans remains unspent. One need to always consult their medical aid company before paying cash or before they stay at home because of not having enough resources for further tests. In conclusion may I say that at times we need to look at the lens that we are using to look at things. A certain person was always complaining that his neighbour’s curtains were dirty. He would look through the glasses of his windows . What he did not realise was that his windows were so dirty that his vision was affected. The neighbour’s curtains were clean after all. Let us have a closer look at our lens maybe we need to adjust them for us to see and appreciate some of the good things that our medical teams are doing in Zimbabwe. Stephen Covey says if we are to change a situation we need to change ourselves first . To change ourselves effectively we have to change our perceptions.